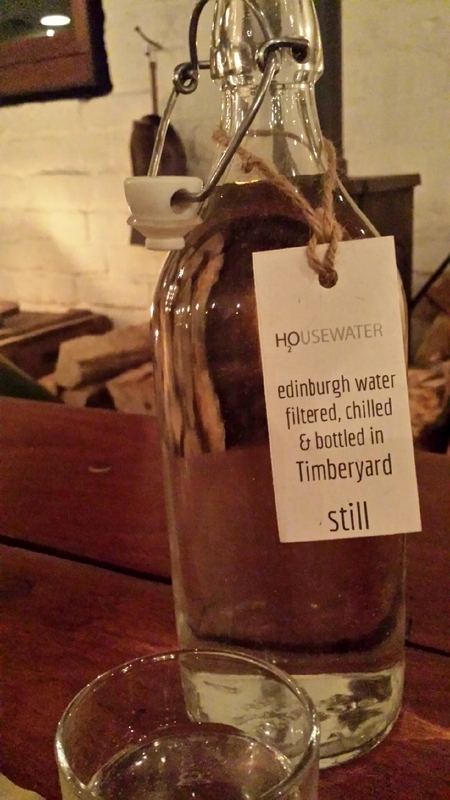 This was actually my second visit to Timberyard situated on Lady Lawson street in Edinburgh. My previous visit was before I started my reviews and since then I have been waiting for an opportunity to go back. I had high expectations this time around. The restaurant is in a 19th century building, converted from an old Timber yard into a warming, contemporary restaurant. The transformation has still retained the building’s industrial heritage but with a warm rustic feel to produce a memorable setting. 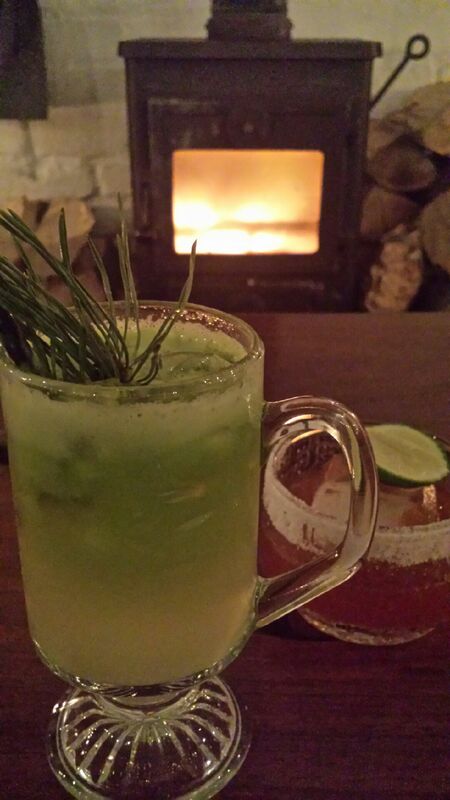 The moment you walk through the big red swinging door you are greeted at the open bar and wood burning stove. My husband and I were seated at our table where tartan blankets covered the back of the chairs giving a snug, homely feel. We were given the daily menu and the set menu and were offered complimentary still or sparkling water. The water is filtered in-house which may not be something to write home about, however it was an early indication of their attention to detail and willingness to deliver beyond the customers expectations. Timberyard also boast a space for growing, curing, smoking, and drying ingredients. This, along with their use of ingredients from local artisan growers, breeders, producers & foragers, allows Timberyard to showcase some of Edinburgh’s finest assets. Both menus have four sections; bites, small, large and sweet. Unlike other set menus you are able to mix and match from the daily menu. However we both opted to dine from the set menu. 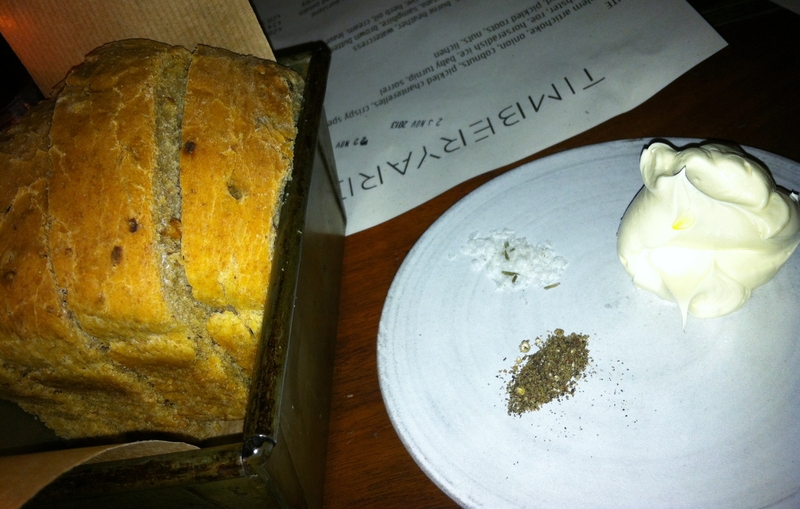 Freshly baked bread arrived soon after we ordered. Still warm from the oven, along with Timberyard’s own soft whipped butter, sea salt and cracked juniper pepper, for some DIY seasoning, was the perfect start to the meal. For my “bite” I ordered ‘Ham Hock Jelly, Quail’s Egg, Toast, Cress, Mushroom, Apple’. This dish was more than just one bite, and each one was delicious. 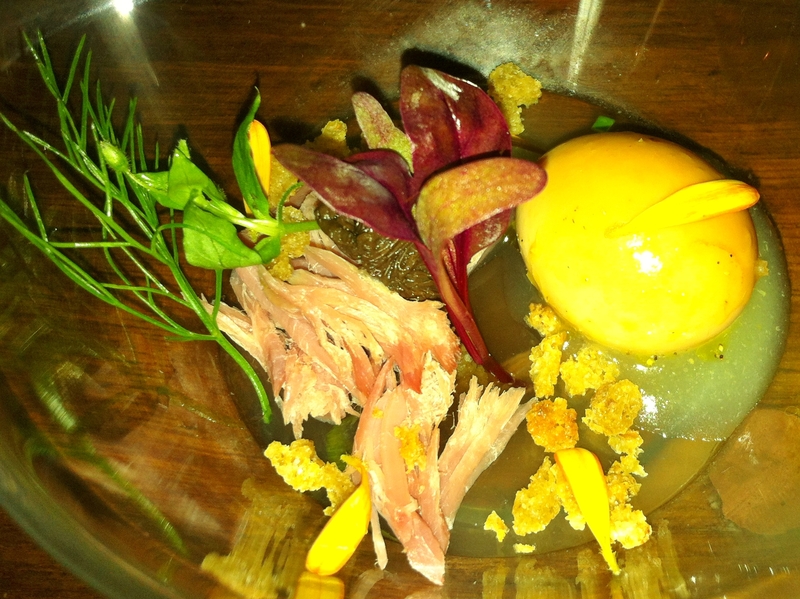 The yolk from the quails egg was soft and runny; the perfect accompaniment for the salty ham. Then, crunchy crumbs of toast added another texture. I couldn’t wait for the next course. 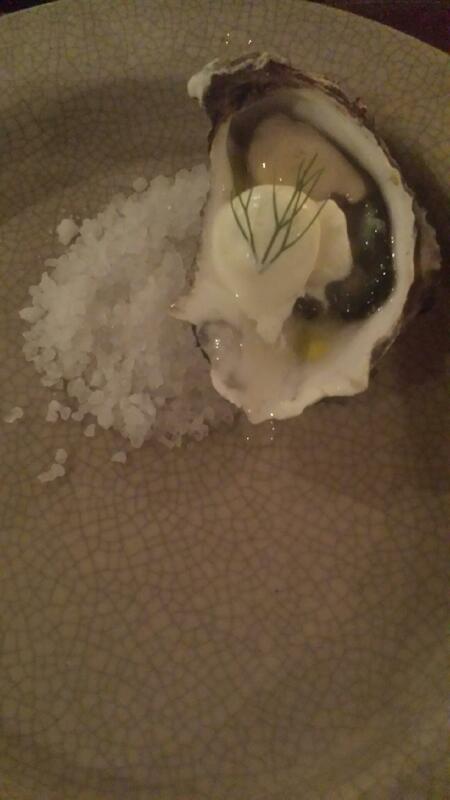 My husband had ‘Oyster, Horseradish, Creme Fraiche, Celery’ for his “bite”. Since this was really just one bite I obviously did not get to taste but it earned very high praise. 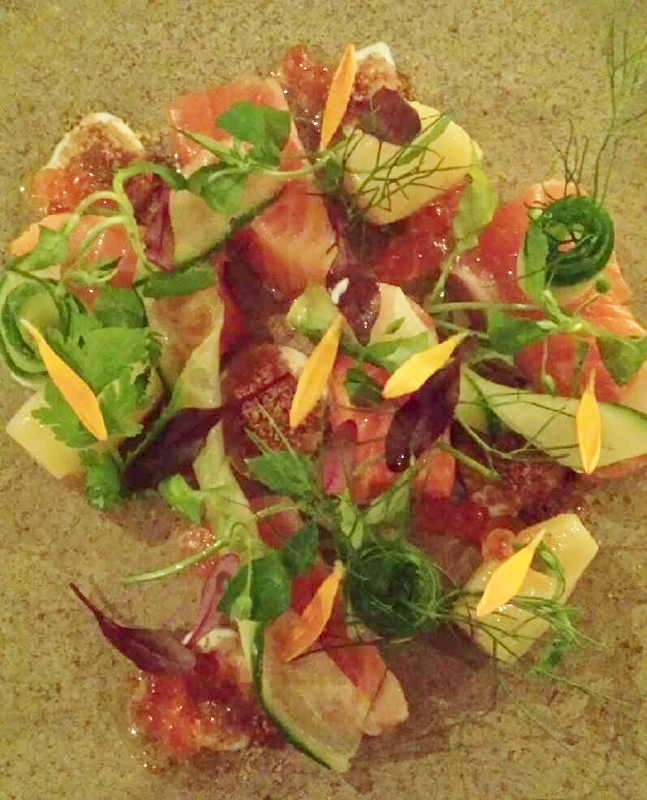 We both opted for ‘Cured & Smoked Sea Trout, Rye Crumb, Roe, and Cucumber’ for our “small” dish. This was such an attractive starter with vibrant colours and was plated in such a way you could see all the different elements of the dish. The different types of trout brought different textures to the dish but both were very fresh tasting. The other ingredients added more layers of flavour but without overpowering the trout. Simply delicious. For “large” we had ‘Lamb Loin & Belly,Beetroot, Kohlrabi, Kale, Radish and Whipped Potato’. 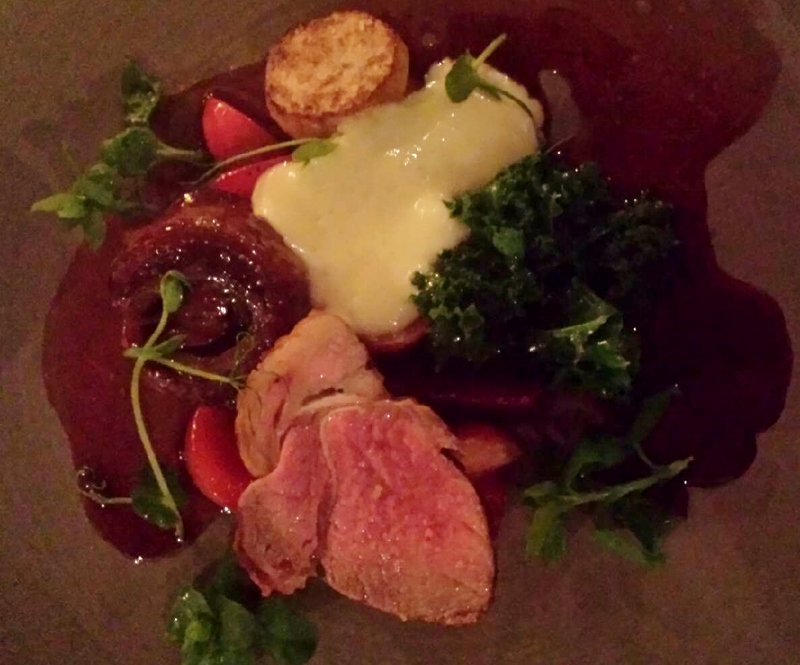 The sweet beetroot complemented the succulent lamb loin along with the earthy kale. The loin was tender and melted in my mouth; cooked to perfection. The whipped cream potatoes were creamy but were almost like a sauce as they were a little too runny. 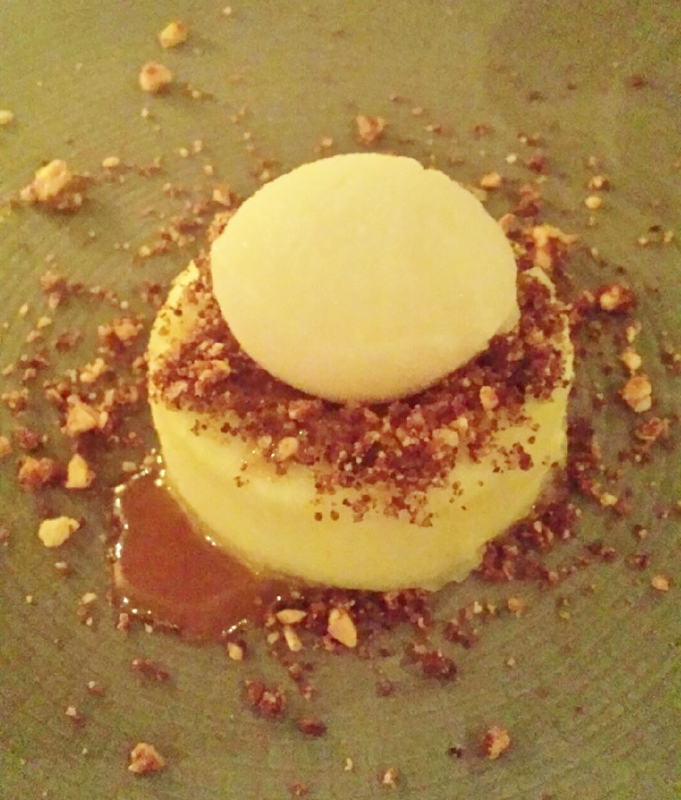 For “sweet” I had ‘Baked Apple, Nut Crumb and Cider Caramel’. On first impressions I thought that it looked very pretty but was disappointed I could not see much cider caramel. However I was in for a surprise. As I took my first spoonful to break the round baked apple I was greeted with oozing caramel spilling out of the centre. Almost like an apple take of the chocolate fondant! Amazing. Not a sweet tooth, my husband was not certain on what desert to have. The waitress was only too happy to give advice on what she thought and he opted for the ‘Sea Buckthorn, Crowdie, Carrot and Biscuit’. This was not a disappointment. In his opinion it was possibly the best dessert he has had. 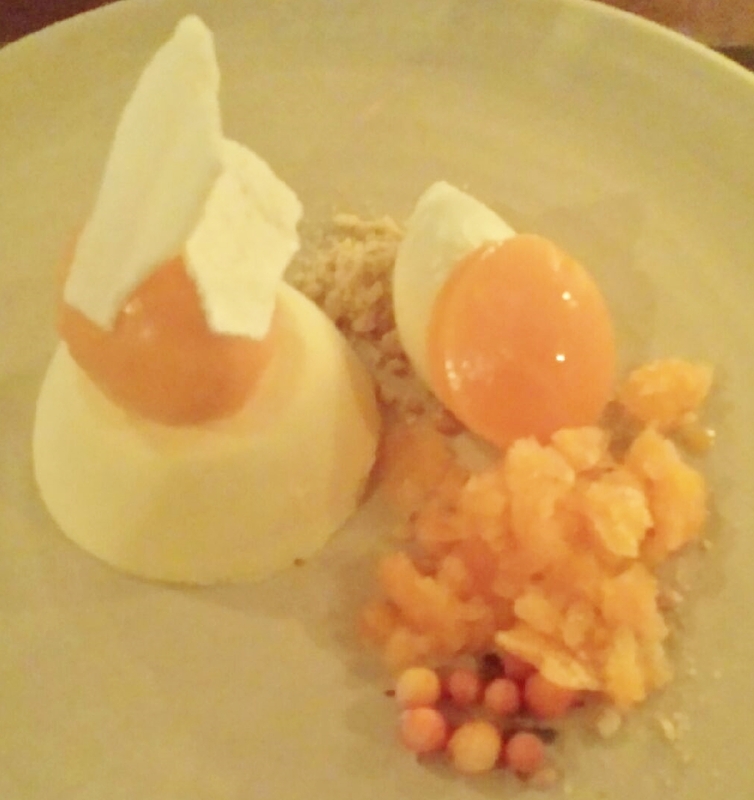 A deconstructed cheesecake with the smoothest crowdie along with sour sea buckthorn and sweet carrot gave contrasting tastes. 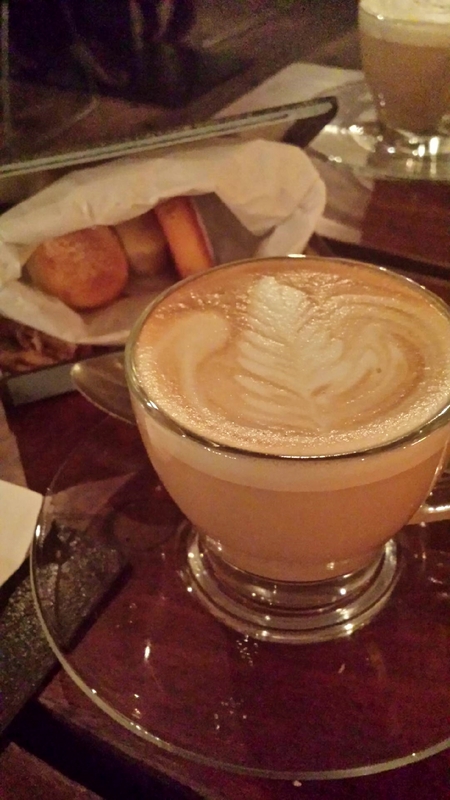 To finish our meal we had coffee which was served with quirky petit fours. These were presented in a paper bag in a cigarette tin on top of some straw. Throughout the evening our waitress was very attentive and friendly. It was only her second night working there but she went out of her way to answer our questions and make our evening enjoyable. My only criticism I have for this family run restaurant is that the menu is very small. I personally don’t mind this as I would try anything but it might put other diners off. Also, if not going for the set menu the Daily is a little pricey. Again however I would pay this for a special occasion as when you go to Timberyard you’re in for a treat. 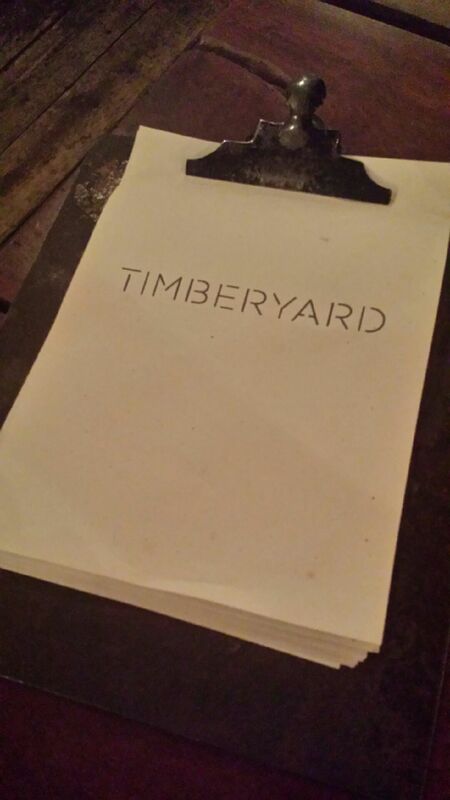 Timberyard has a very relaxed atmosphere that makes you feel special but not in an overpowering way. They do this by providing the highest quality food served with friendly enthusiastic staff in a rustic yet modern restaurant. Timberyard not only provides a restaurant to eat in but a place you can go for a whole evening as the bar area in the middle of the restaurant offers top quality imaginative cocktails and drinks which I felt would be rude not to try!